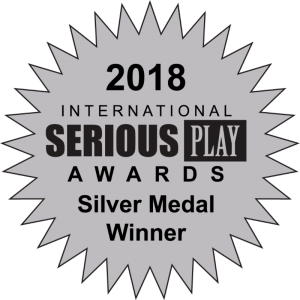 It’s an honor to announce that Serious Play has awarded “13 Minutes Ago” with a Silver Medal, a game that was quite controversial when I released it, but was truly necessary. The Serious Play Conference is a leadership conference for professionals who embrace the idea that games can revolutionize learning. Speakers, who come from all parts of the globe, share their experience creating or using games in the corporation, classroom, healthcare institution, government and military and offer tips on how to move game-based education programs ahead.